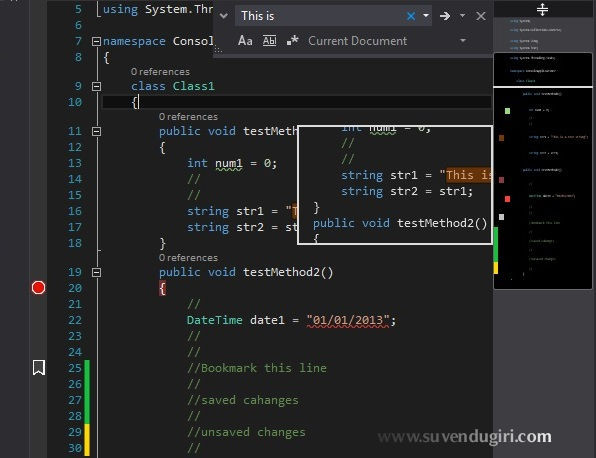 Annotated Code Editor Scroll Bar : With the availability of Visual Studio 2013 Preview, now software development will be more faster using our very own code editor. One of such feature is the annotated vertical scroll bar of code editor window. 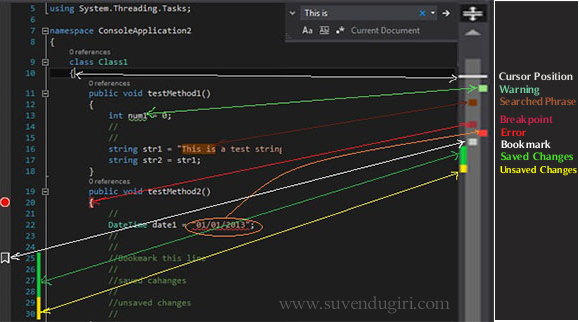 Here is a very informative article about how one can customize the scroll bar to draw the benefits out of it, at MSDN with title “How To: Track Your Code by Customizing the Scroll Bar” . In this post I am trying to create a visual reference of what can be tracked using this new vertical scroll bar of code editor window (hereinafter, I’ll call just ‘Scroll Bar’). Basically, there are two modes of scroll bar are available i.e, Bar Mode and Map Mode. 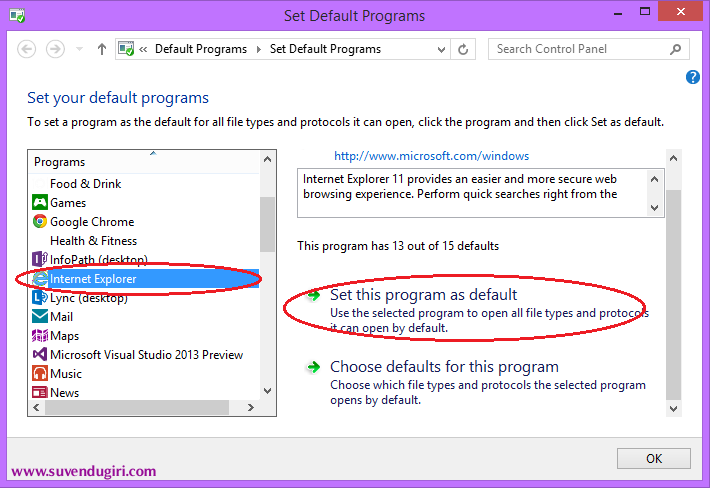 The default mode is Bar Mode and one can change it to the other by just right clicking on the scroll bar and then selecting appropriate choices from scroll bar options. We can virtually consider the scroll bar consisting of three columns. The colored tracking signals/symbols for saved/unsaved changes will be displayed on the left column, Breakpoints,Bookmarks & Occurrence of Searched Phrase will be displayed on the middle column and Warnings and Errors can be tracked from the right most column while current cursor position will span over all three columns. Scroll bar with Map Mode has no any other story to tell about these tracking symbols but keeps them left aligned. With Visual Studio 2013 preview now you can navigate to required code blocks more easily with the help annotated scroll bar. For Example, Suppose you have an error in your code which can be easily distinguished by the red mark on the scroll bar. You can directly view the code snippet generating syntax error in a small pop-up like magnifier, only if you have enabled ‘map mode’ vertical scroll bar and checked for option ‘Show Preview Tooltip’ in the Scroll Bar Options. This is very useful when you are viewing code in a collapsed view where you will not be able to navigate to the line directly except clicking on the particular error in the error list window. Now, as you have a very informative scroll bar which shows you signs for errors, you can single click on it to bring the cursor to the method/block containing that error and you can also double click on the red error sign on the scroll bar to go directly to that line.